So, you love your coffee, and perhaps you like to consider yourself something of an aficionado when it comes to brews. That’s fine, but do you really understand the meaning of all those cool-sounding terms you love to use with such authority? Ah, we thought so. Don’t worry; we’ve got you covered. We’re here to answer all those questions about coffee that the self-professed home barista feels too embarrassed to ask. So, the next time your friends ask the coffee expert, you’ll be able to answer with confidence and authority. Pretty much every coffee-based beverage served in coffee shops is a mixture of two base ingredients: milk and espresso. Depending on what you’re making, you might also add cocoa, ice, sugar, chocolate etc. Espresso-based drinks are usually made in the traditional way, using an espresso machine. 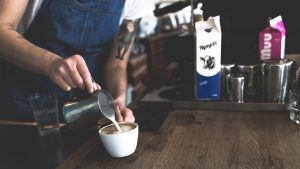 However, these bad boys can be very expensive to buy, so you’ll be pleased to know that you can make a latte and a mocha in the comfort of your own kitchen, without having to break the bank on fancy equipment. What goes into a latte? A latte is an espresso-based milky drink, made up of approximately 1/6 espresso, 4/6 steamed milk, and 1/6 foamed milk. 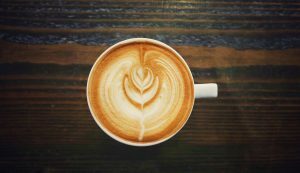 Latte (or café latte, as it’s called in Italy) is preferred by those coffee fans who enjoy the velvet finish of an extra-creamy, diluted brew, without the full-strength coffee hit of a flat white. A standard latte is served in a tall, eight ounce cup. One or two shots of espresso are added to the cup, followed by five to six ounces of steamed milk. The brew is topped off with a thin layer of foamed milk. Different flavorings and syrups can be added as desired. Baristas often add their own touch with beautiful artwork across the foam – it’s a shame to drink it really. Mocha coffee is actually named after the type of coffee beans that are used to make the brew. Mocha coffee beans are named after their place of origin in Yemen. The beans are harvested from a species of the coffea Arabica plant, which is reputedly the first species of wild coffee bean to be cultivated. Thanks to their sweeter flavor, Arabica coffee beans are the most popular, followed by Robusta beans, which have a stronger, rather bitter flavor. Mocha coffee beans have a natural chocolate flavor. In order to enhance the chocolate hit, baristas add a small amount of chocolate to the mocha recipe. Where latte is generally considered to be the lightest, mildest coffee-based drink, mocha is much stronger. In fact, mocha coffee is usually stronger than cappuccino. The traditional Italian way to booze-up your mocha is with a shot of Sambuca, although you can add Baileys, brandy etc, whatever floats your boat. Now, don’t get confused with a mocha latte. This is simply a latte (as described above) with a shot of chocolate syrup added to it. Likewise, a mochaccino is just a cappuccino embellished with a few squares of dark chocolate or with a shot of chocolate syrup added. Who knew? As we’ve said, both latte and mocha coffees need steamed and/or frothed milk. To create steamed and frothed milk you can use the steam wand on an espresso machine. Alternatively, (and more cheaply), you can use a milk frothing device. The frothing device blows steam through the milk to heat it up and incorporate air bubbles into it. The major difference between foamed and steamed milk is the amount of air bubbles they contain. Frothed milk is milk foam whose volume has been doubled by the air bubbles added to it. Steamed milk is less foamed, with an increased volume of about one third. Steamed milk is created by placing the steam wand about one inch into your cold milk, positioned at an angle so that the steam creates a whirlpool effect. Keep steaming until the milk reaches between 1450F and 1550F. Frothed milk is made in a similar way. Place the steaming wand into the milk to create the whirlpool effect. As the milk begins to foam on the surface, move the wand gradually down through the milk, until it reaches the bottom of the cup. As the froth forms, the milk volume expands, and you’ll need to move the wand further down. So, now you know the difference between latte and mocha. Basically, they’re both espresso-based drinks. Latte is perfect for those who don’t want the full-strength coffee hit, while mocha gives you a stronger coffee experience with dark chocolate undertones. Why not check out your local coffee shops to sample both, and then try experimenting at home.